Want to learn how to add clickable Instagram links or link in bio on Instagram? You’re in the right place. 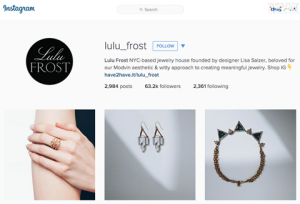 Looking to add a clickable Instagram link to drive more people to your website? As you may or may not know, it’s not possible to add clickable links in captions and comments on Instagram. On most social media platforms, you can share clickable links to your website in most places. In your captions, in comments, in your profile, and so on. On Instagram, the number of places you can share clickable links is highly limited to one or two places. Instagram’s decision of limiting the places where you can put clickable links has been a debated one, but there’s obviously a thought behind the decision. 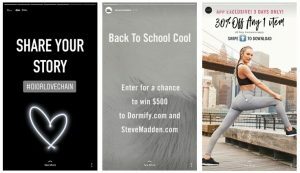 The decision to limit the places where you can share clickable Instagram links was taken to crack down on and prevent people excessively using self-promotional links, or more correctly, spreading spam on Instagram. This type of spam on social media mainly happens in the comment sections as well as in posts. This just doesn’t go for Instagram, which has prevented spammers from using Instagram as a platform for spamming, at least through posts or comments to a large extent, but on platforms like Twitter and Facebook, dealing with spammers who are spreading their clickable links is a constant challenge for these platforms. In other words, the bots and spammers are destroying it for everyone else, making it harder for you as a marketer and businesses to use Instagram as a marketing tool to drive traffic back to your site in order to convert people into customers. The good news is that Instagram hasn’t completely limited the places where you can share clickable links on the platform. You just need to be more strategic about how you use the places where you can share clickable links in order to get the most out of them. Fortunately, in this article, I’ll share with you how to add a clickable link in your Instagram bio, where you can add clickable Instagram links, and how you can leverage the clickable links on Instagram to drive traffic back to your site in order to ultimately generate conversions. Use Instagram as a marketing tool for traffic and conversions in other words. Anyone can add a clickable link to their Instagram bio, and it’s super easy to do so. The catch is that you can only add one clickable link in your Instagram bio, so you need to think about which link you want to have in your profile. On the flip side, you can change your clickable Instagram link in your profile as many times as you want. To add a clickable link in your Instagram bio, simply go to the ” Edit Profile” section on your homepage whilst in the app. Once tapped “Edit” type in the URL of the website you wish to link to in your profile in the section which says “Website”. As a business leveraging Instagram, you want to use as many places where you can share clickable links on Instagram as possible. Some businesses are sharing links to their website and specific website pages in their captions or comments, but the problem is that they aren’t clickable, and so if people are to visit that website, they would have to go to their browser and then manually type in the URL. This is, of course, a lot of friction for the users, and it’s something that very few people will actually take the time and effort to do. If you have a long URL with a bunch of numbers, essentially no-one will do it. In order to convince as many people as possible to visit your website in the hopes of ultimately converting them, you need to create as little friction as possible. This is what clickable links does, compared to having to type in your website URL manually as a user. 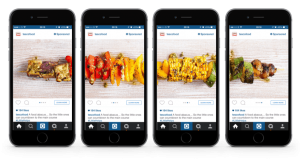 Let’s look at the other places where you can share clickable links on Instagram. Instagram Stories is probably the most effective place to share clickable links on. The reason is that through Stories, you can storytelling and engage your audience through a story, and then encourage them to click on your link and visit your website. With a link in your bio, the closest place where you can encourage your audience to visit your website is in your regular posts, and going fro your post to clicking the link in your bio is a bit of friction as it may cause a disconnect Ideally, the links you share should be seamless with the user experience and take the audience to the exact website they are looking for. This is not possible to do in the same way when sharing a clickable link in your bio on Instagram compared to when sharing a link in Stories. 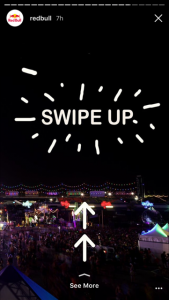 Links on Instagram Stories aren’t actually clickable, but ”swipeable”, which means that in order to get to the website that you’re sharing with your audience, people swipe up on the screen, getting seamlessly directed to your website. The catch with links on Instagram Stories, however, is that you need to have at least 10K followers or a verified Instagram account. It’s generally more difficult to get verified on Instagram than it is to get 10K followers, though. Instagram has set this limit as another attempt of preventing spam since the vast majority of spammers are accounts which have recently been created (and are often equally quickly banned) and are used for spreading spam-links on the platform to spam sites. Of course, the limit of 10K followers limits many small businesses from using this tremendous way of driving traffic back to their site to use Instagram as a marketing tool to drive conversions, but Instagram seems to be satisfied with their decision as they haven’t changed this number since the ability to share swappable links on Stories was released. To add a link to your Story, create a story just like you normally would, either by recording a video, taking a photo, uploading an existing piece of content from your photo library, etc. Then, tap the chain in the top right corner of your screen (the link icon) and paste (or type in) the website you wish to link to through your Story. Have in mind that the chain icon will only appear if you have a verified account or a business profile with more than 10,000 followers. As you tap the chain icon, a new window appears where you can insert your URL. When you are done, tap ”Done” or the green checkmark. When you have shared your Story, you can see how many people have swiped up to get to your website by swiping up on that story to get insights into its performance. The third place where you can share clickable Instagram links is in Instagram Direct Message. As a marketing tool, it’s not the most effective way to share clickable links, since you risk being considered a spammer if you start sending a bunch of links to people on Direct Message. On the other hand, if you are talking to someone, potentially a customer, who might be wondering about a specific product etc, the possibility of sharing clickable links on Direct Message is great, as it allows for a seamless user experience. Anyone can share a clickable link on Instagram Direct message Simply type in the URL to the site you wish to share with someone and tap send. Instagram shoppable posts is a huge update which was rolled out for all businesses not too long ago after a long period of beta testing. The update allows businesses to ”tag products” with the name of the product as well as the price of it. Then, users can tap on the tag and get directed to the website of the business where the product is available and get more information about it. The idea of product tags is that they should be tagged on products that can be seen in the image so people can get inspired by a photo on Instagram and become intrigued to learn more about it or even purchasing it. Have in mind that Instagram shoppable posts tags are not available in all countries nor is it available to all users. In order to be able to use Instagram stoppable tag posts (Clickable Instagram links), your account must be approved for shopping on Instagram. Go to your Instagram profile by tapping in the bottom right corner. If you cannot see the alert, tap the cog-wheel icon in your profile. Now, select a product catalog you wish to connect to your business profile on Instagram with. If you cannot find Shopping in your business settings it probably is the case that your account is still under review or hasn’t been approved for shopping on Instagram. When you apply for shopping on Instagram the process usually takes a few days, however, it may take longer. Tagging products on Instagram to create clickable Instagram links is super easy once your account has been approved for shopping. Now, tap the ”Tag products” option beneath the photo. Tap the products which can be seen in the image that you would like to tag. Search for the names of the products you would like to tag. Have in mind that in order to tag products on Instagram you first need to create a product catalog on Facebook. When you find the product you wish to tag, tap the product and put it on a good spot on the product. Instagram allows you to tag products in new and existing posts, but remember you need to have a business profile to be able to do so. You can tag up to 5 products per single-image post or up to 20 products if you share a carousel with multiple images, and you can edit or delete products you’ve tagged in single image posts on Instagram. Once you’ve shared at least nine posts on your Instagram business profile where you have tagged products, you will activate the Shop tab for your audience, which is a tab in your profile which users can tap to see all the products that you’ve tagged in your posts. From there, they can tap the products they like and be able to directly shop from your website. 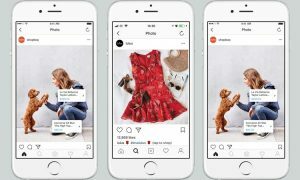 In that sense, it is a clickable Instagram link, but more importantly, it is one of the most seamless shopping experiences for users, and a tremendous way for businesses to integrate Stories with their products and make it easier for their audience to buy. Instagram shopping is just a tab in your profile, but one that businesses tend to neglect as they focus on the tag themselves of the posts, however, Instagram shopping is a way to present and showcase the products you sell like in a catalog and do it in an integrated and seamless way which removes friction. Using Instagram ads is the only way to share a post on Instagram where you can direct people directly to your website (and not a specific product) Before Instagram shopping, using Instagram ads was the only way to include links of any form in a regular post on the platform. With Instagram ads, you can include a clear call to action buttons which are also clickable Instagram links which can drive your audience to your desired website. If users tap on your post, they will get redirected to the page you select, which enables a seamless user experience which is great for traffic and for purchases. Pro Tip: Engage and be in contact with your Instagram audience on a daily basis by accessing emails with Office 365 suite from O365CloudExperts. Thanks a lot. I looked for this any place and non of them worked. You saved my life. Thanks again. I want to add my Blog link (https://clickbystyle.blogspot.in/) to Instagram Bio. If i add this link to website on Instagram bio and click on it, it open again my Instagram account. I want that should open my Blog. Can you elaborate a little bit about what you mean? If you go to your Instagram profile, go to profile settings, add your website link and tap “save”, you should be redirected to your website if you then click on the link in your profile. Hi Jennifer! It is unfortunately not possible to have two clickable links in your profile. The alternative is to have the other site in your page description (bio), but this link will not be clickable then.